Did you know that more than 70 % of women wear the wrong bra? They are either wearing the wrong size or the wrong style for their figure. You MUST know your correct size and that would be your starting point. Bra sizes can change dramatically across bra brands, just like bra types, but knowing how the bra should really fit, it will not be that hard. Let's start with the bra band size. You can see that you are wearing the wrong band size if the back band rides up and you keep tightening the straps(which dig into your shoulders) until you have a good fit. But this is wrong. The band should provide most of the support for the bra and it needs to sit horizontally across the back. You shouldn't be able to pull the band more then 2 or 3 fingers from your back. Also when you try a bra, fasten it on the loosest hook because over time the band becomes loose and you will need to make it tighter. How should your cup fit.. If the difference in inches is 1 you are A, 2 -- B ,3 -- C and so on. The underwire should lie flat against your skin (1) and your chest (3). It shouldn't be pushing out the front. It needs to be sitting behind the breast as well (2). You don't want your skin spilling over the sides of your bra. (4) You should go up a cup size if your bra is cutting your breast or down if that area is not supported and the bra feels loose. 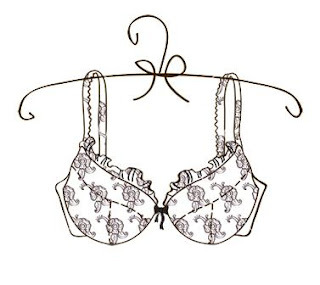 You should experiment with different bra types to find out which ones work best for you.For example : A woman that wears a small cup may find it hard to find a fitting full cup bra and a triangle bra would work better depending on her shape.